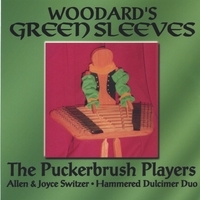 Hammered Dulcimer with whistle and bodhran. Gentle "folksey" music. What could be better than the haunting, joyful, and enchanting sound of the hammered dulcimer? TWO hammered dulcimers!! A life-long interest in many types of music led us to the Original Dulcimer Players Club of Evart, Michigan. It was love at first sound. A few years and many hours of practice later, we are sharing our music with the public as performers and workshop leaders. Our current work is mainly folk and traditional music in historical reenactments, but the dulcimer also lends itself well to contemporary music. Our dulcimers often share the stage with a Flageolet (wood whistle), an Irish bodhran (drum) and a limberjack named Woodard (our mascot). This recording was given 4 stars by Renissance Magazine.